« Essen ’07 : New games and designers ! This entry was posted on Friday, October 12th, 2007 at 23:33 and is filed under BattleLore, Games. You can follow any responses to this entry through the RSS 2.0 feed. Both comments and pings are currently closed. Cattle Riders – too cool. Why more Dwarven spear chuckers? 42 figures is something, too bad that there are many dwarves. I think that having too many bold units makes the game less tactical. I belive one reason for more spear dwarvs is that we need a sertain number of units to make it possible for an all dwarf deployment deck. The circular formation with spears was called a schiltron although, to confuse matters more, schiltrons did not necessarilly have to be circular. Ah saw a coo… A bull by Goad! 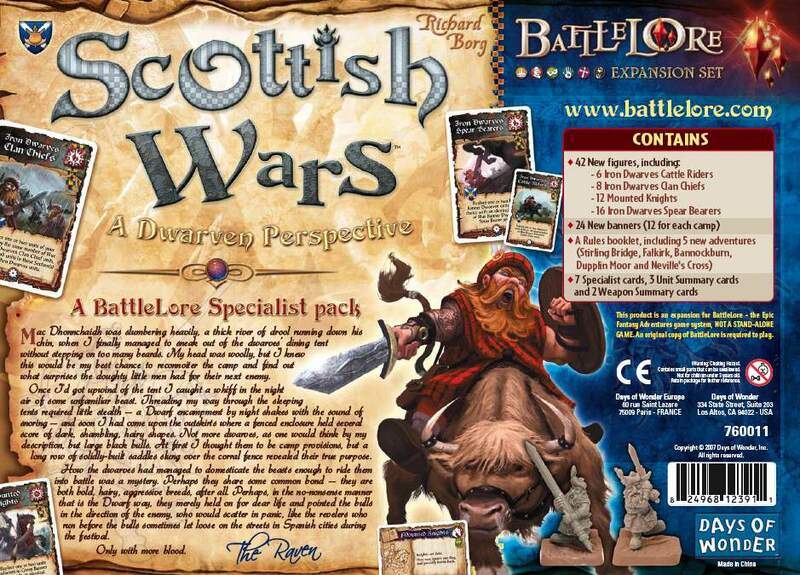 This is, of course, the most appropriate way for dwarves, Scots or otherwise, to be seen!